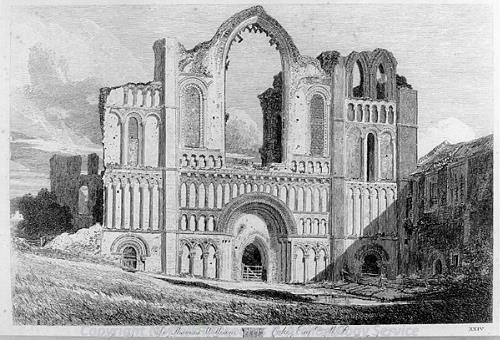 Print, 'West Front of Castle Acre Priory' by John Sell Cotman (1782-1842). On plate bottom right of margin 'I'. On plate bottom left of margin 'Drawn Etched & Published by John S. Cotman Yarmouth Jany 1813'. On plate bottom left of subject 'J.S.C.'. On plate bottom centre of margin 'To Thomas William Coke Esqr MP / This Plate of the West Front of Castle Acre Priory is Respectfully Dedicated by his Obt St John S. Cotman ( with coat of arms)'. 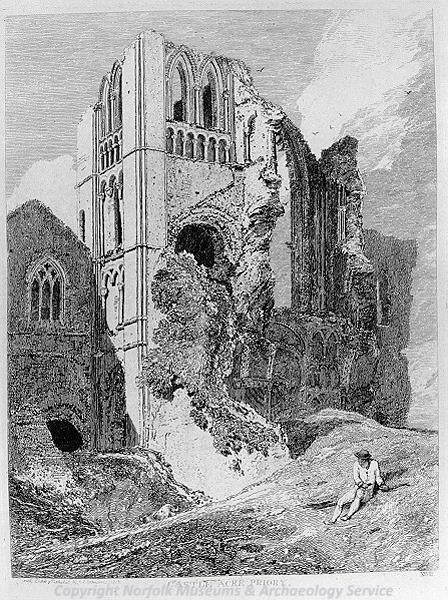 Print, 'Castle Acre Priory' by John Sell Cotman (1782-1842). On plate bottom right of margin 'II'. On plate bottom left of margin '...outh Etched & Published by J.S. Cotman 1813'. On plate bottom centre of margin 'Castle Acre Priory'.